We recently worked with Pato Paez and Imuri Design to complete a series of striking 11 foot tall images for the opening of the new Revel Hotel in Atlantic City. These colorful and graphic images were printed on matte canvas and laminated to wafer thin aluminum Dibond panels to sit flush on huge sliding steel doors. The project was made more exciting by the last minute rush to complete in time for the opening. The whole project took 3 days to print mount and deliver to Atlantic City. Alex's seventh solo exhibition opened on on February 25th, 2012, at the Jonathan LeVine Gallery, in New York. Twenty oil paintings on canvas, panel and paper were be featured, as well as 25 mixed media paintings on antique cabinet card photographs. In remembrance of the 10th anniversary of 9/11, LaGuardia Community College is hosting a multi-media exhibition by 15 artists, many from Lower Manhattan who were eye witnesses to the tragic events. Brooklyn Editions prepared and printed large scale images of some very haunting and powerful sculptures by Michael Richards. They are prophetic for their chilling vision. In 1999 Michael Richards cast his own body in plastic resin to create “Tar Baby vs. St. Sebastian.” St. Sebastian was an early Christian martyr who was executed by being shot full of arrows. However, in this sculpture it was a Tuskegee Airman who was was being pierced by multiple airplanes. He made the life size self-portrait in 1999 and was killed on Sept. 11, 2001 during the World Trade Center attack while in his art studio on the 92nd Floor of the Twin Towers. While his work dealt with a much different theme; the metaphor of the all-black Tuskegee Airmen’s Squadron of the Second World War, men whose images Richards (using himself as his model) often returned to in his work. The Tuskegee airmen were awarded more than 150 Distinguished Flying Crosses but at the same time their Alma Mater was used for illegal experiments on black men to test the transference of syphilis. The contrast between the freedom of aviation and the metaphor of airmen crashing and being attacked speak to greater social issues. The exhibition opens at Saturday September 10th and will be on display through November 23rd. I recently had the opportunity to collaborate with multimedia artist Ester Partegàs for her new show More World. Working with Ester is always fun and she presents a different challenge every time. From giant garbage bags to French fries she continuously explores new ways to examine evidence of our disposable consumer culture in graphic and colorful ways. She is always interested in trying new and different surfaces. Ester is always focused on the consumption and marketing, so the surfaces we choose play an important role as an object and often must either compliment or contradict the subject matter. For this show she printed a series of French fries on beautiful Hahnemühle Photorag 308 paper and a created a light box of a landscape found on construction site mural in China which we printed on Back Light film. Press Release: More World, ESTER PARTEGÀS' latest solo exhibition at Foxy Production, plays with perceptions of excess, anxiety, pleasure, and deprivation. More World combines wallpaper, drawings, prints, sculpture, and video in a charged environment of color and contrast. Nature within the city, packaging, and fast-food provide inspiration for the artist’s ironic takes on the psychic underpinnings of landscapes, surfaces, and objects. Partegàs unpacks Pop, contaminating it with trash, removing its logos and references, and infusing it with a corrupted photo-realism. Private and public spheres sit uneasily together, as the artist traces the process of consumption: from the birth of desires in marketing to the final transformation of products into trash, the symbol of depletion and, perhaps, death. 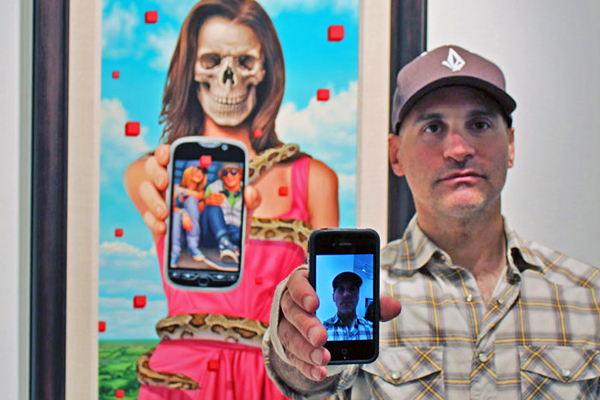 My brother the painter Alex Gross and I have finished work on some new limited edition prints that are now featured in his online store following his successful show Discrepancies at Jonathan LeVine Gallery. Alex paints in oils with amazing detail and subtlety. Preserving this quality and satisfying his very particular eye is always a creative process. No matter how perfect a capture we start with, recreating the sensibilities of the oils is always a challenge. Adjusting contrast for a painting is very different than correcting for a photograph. Most paintings rarely have a perfect black or pure white so the corrections must preserve all of the shadow and highlight detail. Alex lives in LA, so our creative exchange is via FTP and Fedex. Generally one set of proofs and a file with a few adjustment layers gives him the options to get things looking exactly the way he wants.